Despite it's name the Big Apple did not actually originate in New York. It evolved and first became recognized as a dance form in Columbia, South Carolina. Putting an exact date to the creation of a dance is always difficult. It seems most likely to have formed in the early 1930's with the dance slowly gaining popularity and spreading into other areas of South Carolina through to the mid 1930's. 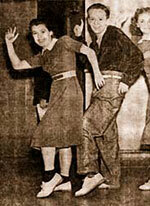 At that time of racial segregation the dance evolved soley in the African American community. However, as with many dances of the era it was soon picked up by the whites and quicky gained popularity and became more widespread as a result. Betty Wood an original white Big Apple dancer said "It all began at an abandoned synagogue that had been turned into a Juke Joint". In 1930 she was aged sixteen and heard music coming from a juke joint when out driving with friends. They went in and were allowed onto a mezzanine reserved exclusively for whites. The racial segregation of the time meant there was no mixing of races (particularly in the deep south). The main floor and dance area were only for African-Americans with the whites confined to watching from a mezzanine above. They were inspired by watching the dancers doing lots of different Jazz steps and improvisations on the floor below them. They recognized some of the steps as coming from other dances they already knew such as the Charleston, Black Bottom, and original 8-count Collegiate Shag. They came away with the idea of a dance made up of individual jazz steps, performed in a circle, as called by a leader. The dance was an instantaneous hit in the white community with people coming to South Carolina from all over the country to see the new Big Apple dance they'd heard about. There are also accounts that after a while a new variation developed called the "Little Apple". This form involved fewer dancers and people would take it in turns to grab a partner and move to the center of the circle and dance for a while in styles similar to Lindy Hop, Shag, or other dances of the era. In 1937 the Roxy Theatre chain commissioned a travelling stage show based around the Big Apple. They held the auditions for dancers in Columbia and 16 local kids were selected (Betty Wood was one of those chosen few). The show was a great success playing for two years at Roxy Theaters all over the country. While the show was in New York it was seen by Herbert (Whitey) White, the manager and driving force behind Whitey's Lindy Hoppers. Whitey described the dance to his lead dancer Frankie Manning, asking him to create a Big Apple piece for their group. Frankie had never actually seen the Big Apple but remembered the summers he'd spent as a child at his father's family farm near Aiken in South Carolina. This would have been in the 1920s and he recounts often seeing African American farm workers doing what he called a "ring shout". The workers would get in a circle, sing and clap, urging each other to get in the center and improvise. He reminisces "I remember my grandmother putting me in that circle". Many of the steps that Whitey had described were already part of the Lindy Hop. Frankie simply combined these into the circular concept and created the historical blue print for what is now often remembered as the Big Apple. He says "It had already exploded in New York. We started doing it in the Savoy every Saturday night, but it wasn't always the same Big Apple." The version that Frankie created for Whitey's Lindy Hoppers was used in the movies and has thus been preserved for all to see. The film was called "Keep Punching" and is about a young black boxer on his way to the top. It premiered in Harlem on December 7th 1939 and the cast includes some famous black actors and performers of the time. The Big Apple sequence features one of the Whitey's Lindy Hoppers' troups including of course Frankie Manning. The Big Apple was without a doubt one of the biggest dance crazes to ever hit America. It's widespread popularity was also fuelled by the Arthur Murray dance school. In fact, according to their web site "it was the Big Apple that launched Mr Murray's studio into the largest chain of dance studios in the world today". Arthur Murray was an enterprising white dance instructer who by 1936 had two New York based dance studios. He saw the dance at one of the Roxy Theatre shows and began running Big apple courses at his studios. They proved so popular that his business rapidly expanded opening franchises in several cities across the country. By the spring of 1938, the Big Apple had become a full-fledged cultural phenomenon. Life magazine had already run a pictorial showing how to do the dance. The dance became so popular that some clubs posted signs stating "Sorry No Big Apple. Not Enough Room." Big Apple prints made by Chicago's Marshall Field & Co. on silk and rayon were sold nationwide. There were Big Apple party dresses, purses and housecoats. Even the son of President Franklin Roosevelt, celebrated his engagement with a Big Apple dance in the White House. Alledgedly by 1939, the British Prime Minister Winston Churchill was doing the dance. Crazes often die even quicker than their original rise to fame. This was the case with the Big Apple. The young kids lost interest once the dance became widespread and adopted by older people from the higher social classes. The dance lost it's street credibility, the young kids moved on to newer ideas and the dance began to fade from memory. Fortunately in 1950 Mura Dehn included the dance in her documentary of African-American vernacular dance. The Big Apple features in the 2nd chapter of "The Spirit Moves" her remarkable archival film of African-American dance which consists of studio demonstrations of authentic jazz dance forms by artists of the Savoy Ballroom of Harlem. This film features many of the original Whitey's Lindy Hoppers and served as a usefull reference point for later dance historians trying to rediscover the roots of the dance. One of these dance historians was Lance Benishek who in 1992 was able to find Betty Wood and brought her out of retirement. He learnt many different dance steps from her and they now teach original 8 count collegiate shag and Big Apple together. Lance has taken Betty on trips to Sweden, England, and all over the United Sates to spread knowledge of these historic dances. This page has been pulled together from my knowledge and experiences of the dance built up over the years. I've made every effort to be as historically accurate as possible. However, there is very little published information to check against. I've tried to collect as much information together as possible and publish it here as a good starting place for anyone wanting to learn about the history of the Big Apple. If you have any further usefull information about the dance then please let me know and I will make any necessary amendments or additions.